Many years ago someone told me about a popular book titled Desiring God by John Piper. That was a little over 11 years ago. That book was a too deep for me at the time as a young Christian but after some time in the word I have a great appreciation for its content. Since then I have gone on to read many of John Pipers books, articles, and even have listened to many of his sermons thanks to the wonderful world of iPods. His overall ministry to the Church is one that many preachers will never experience. I say ministry because in the past decade Desiring God Ministries has continually grown. It is a place on the web where you can find biblically sound teaching through articles and grow in your faith in greater ways. On this website you will also find many of his books that you can bring up on a PDF format and print out. I don’t know of many ministries or writers who will let you do something like that. Perhaps that says a lot about who Piper is and his desire to see Christians grow in their faith. 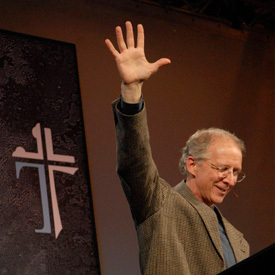 If you don’t know who John Piper is I invite you to look him up on CBD (ChristianBooks.com) and order one of his books. If you want to go deeper in your faith and like to be challenged this is a guy you want to read. The book Sensitivity of the Spirit by R.T. Kendall who is the former Pastor of Westminster Chapel in London is an outstanding contribution to the work of the Holy Spirit. In the Church today we have confusion over the Spirit of God which is c0-equal with God. He is a part of the Trinity and yet He is not sought or discussed like he should be. Kendall in this work describes the leading of the Spirit and addresses the way in which Christians can quench Him from their lives. The premise of drawing closer to God is present with the pitfalls that many Christians fall into and the reason why the Spirit is not guiding them. If you care about holiness and want to experience the power of the Holy Spirit in greater ways I recommend this book to you. This is not a treatment on tongues but being sensitive to the leading of God in your life. Too much of the time Christians think that they have a handle on God when in fact we are just going through the motions. I do not readily recommend every book on the Holy Spirit that I read, but this is one I will be passing along for a long time. Over the past few days I decided to read Confessions of a Reformission Rev by Mark Driscoll. It is an interesting perspective of how a Church Plant in Seattle Washington became a Mega-Church in less than 10 years. What I liked about this book was the desire to reach those who are not saved. Driscoll is an authentic writer who can seem harsh at times, but his attitude is something that the traditional church could learn from. He is an in-your-face sort of guy that I appreciate. Any one interested in re-thinking church growth and the struggles it takes to truly move a church forward should read this book. There is great substance mixed with the troubles that come with moving forward. This is not a how-to book since it is about the context of this church growing, but it serves as an example of where priorities need to be for God’s people. Last night a retired Minister in my congregation put The Life God Blesses by Jim Cymbala into my hands. I started to read it this afternoon and found myself half way through it already. It is small in size and anyone could read this book quickly. I am a fan of Cymbala and his writings already so its no wonder that I think the world of this one already. In the Church today there is a lot of gimmicks and Pastor’s are prone to chase after them on a regular basis. Cymbala in this book (much like his others) is calling those who serve Jesus back to some fundamental practices that are definitely missing in the Church today. If you want to be refreshed and need to get back to the basics this is a book for you. If you need to be reminded of faithfulness and prayer this book is one that will help prompt you to get on your knees and re-evaluate your relationship with God. This book is refreshing in light of the self-help junk that is labeled Christian in today’s market. During the past week I picked up The Unwavering Resolve of Jonathan Edwards by Steven J. Lawson and found that I had a lot to learn from one of the last Puritan Preachers of our country. In this book Lawson focuses on many of the Resolves that Edwards made and how he strived to live out the Christian life in the context of his day. His struggles and how he dealt with them are portrayed in a good light throughout this book. This book is small in size and has the potential to bless any Christian who picks it up. In a day that is lacking holiness and integrity this book is a great reminder to any Christian that our life with God is only what we make it. This fall I picked up a copy of Authentic Faith by Gary Thomas at the suggestion of a friend. I had never read a book by this author, but was familiar with him through his successful book Sacred Marriage. As I began to read this book deep conviction came that I was not expecting. This was one of those books that I could not put down. This book discusses the basics of being a Christian, but not in a way that you would expect. Thomas goes deeper than most Christian literature does and needs to. If you need to work through some areas of your life with God and want to be challenged then read this book by Thomas and you will see how serious you are about Jesus being Lord. Over the past few weeks I have been reading the book Humility by C.J. Mahaney which is pictured above in this post. I chose the book to challenge myself and to examine my life in light of this topic. Humility once theologian has said is the hardest thing to accomplish in the Christian life. While I agree with the theologian I also must constantly remind myself that I am commanded in the New Testament to humble myself before God if I expect to grow in greater ways. This book is a book that I sincerely believe that every Christian should pick up and read. It is small in size but packed full of insight and wisdom that will hopefully force you to put it down after every chapter to reflect upon your walk with God. Humility is not just a life of seeming like we are giving in with certain people or areas of our lives. Humility encompasses who we are as a whole. Mahaney in his treatment on this subject broadened my thinking about this and while reading through the material the Holy Spirit laid upon me several convictions. Those convictions are areas that need to be dealt with in a season of prayer and a desire to grow in new ways. If you are a Christian and you know that you have some issues that have been frustrating you the problem could be your own pride. You do not have to stay frustrated! Pick up this book and examine yourself with a man who has problems (he admits it throughout the book) and a Pastor’s heart and see what you need to work on. Paul told the Church at Philippi to “work out your salvation with fear and trembling” and that command applies to everyone who professes allegiance to Jesus.